The British Gazette » Europe: On the brink of civil war. 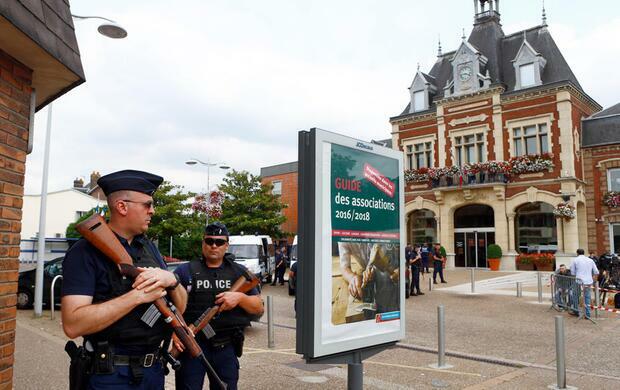 British Gazette comment: The latest IS terrorist outrage in Saint-Etienne-du-Rouvray when two terrorists entered a church this morning during Mass near and murdering the 84-year-old priest by slitting his throat and took hostages before being shot and killed by police is now one of a line of incidents that are clearly designed to provoke non Muslim Europeans against the millions of Muslims already living in Europe with ever greater numbers standing at it’s gates and even more to come from the wombs of Muslim women in the future. NB: The terrorists will persist until they have achieved their aim. To bring the civil war that rages in Syria to the streets of Europe – including the UK.